Minutes earlier scouts running full speed and reaching his dug out breathless reported an imminent attack and their report was joined by the growl and clank of enemy armoured units negotiating the slope just out of view. Popov’s unit had only arrived yesterday and had barely time to construct anything other some rudimentary dug outs. Despite increasing enemy activity in front of the corps position they had been instructed to march east and take up the position they now held. The commissar’s war had so far had been uneventful; inserted into a relatively quiet heavily wooded sector on the Leningrad Moscow road most enemy activity had been directed north and south of the corps’ frontage. He knew his NKVD division was well equipped and ready to die for the motherland – he just had not expected it would be so soon. The mean looking angular machines of the Fascist invaders crested the hill, the troops huddled behind looked cold and malnourished but just as mean as their machines and just as determined. The 75mm shell from the lead tank hit his dug out full on catapulting earth, branches, logs and men skyward. For Popov the war was over. Finland & Army Norway: In the centre the German division continues to press forward and aided by air support out of Norway eliminates another winterised regiment. The Finns meanwhile eliminate a motorized division in their march east. AGN: The Germans manage to assemble a scratch relief force and with the help of the isolated troops of the 18th pz and 18th Mot divn break through the soviets via the heavily forested section of the line allowing the mech elemnts to re-join the main force. 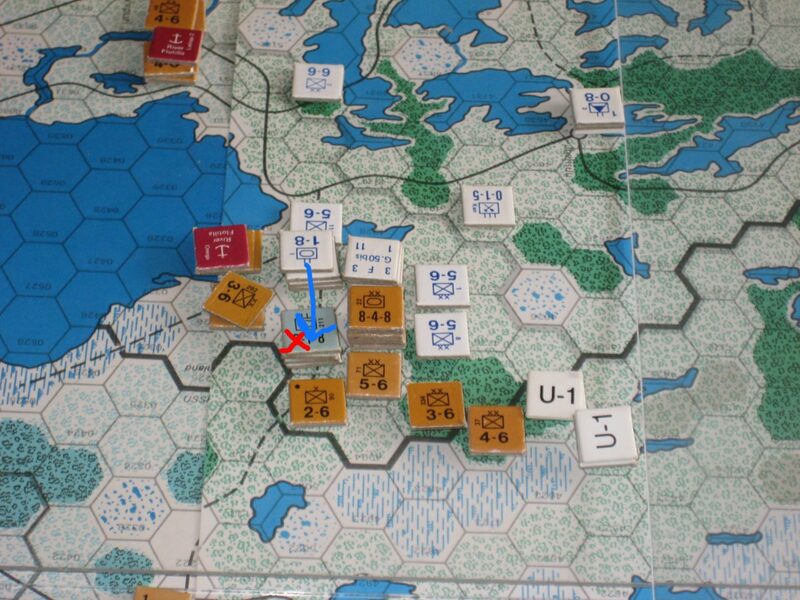 In front of Kalinin an out of supply fort is eliminated and a counter-counter attack secures another hex north of the city. AGC: The German forces contemplate an attack on a second Moscow district but with winter setting in they need engineers and siege guns to do so. Rail conversion now reaches Moscow and the siege train is positioned for an assault next turn. In lieu of an assault they retract one hex back east of the metropolis to concentrate defences for an expected Soviet counter attack. Just south of Moscow the Axis are content to eliminate the two isolated forts. AGS: All quiet on this front. The Kharkov besiegers now in full supply for the first time are enraged that the promised siege gun support has been diverted to AGC but muster engineers and artillery for their own assault. 11th Army: The desultory unsupplied campaign continues in the Crimes eliminating a single division and trapping two more. 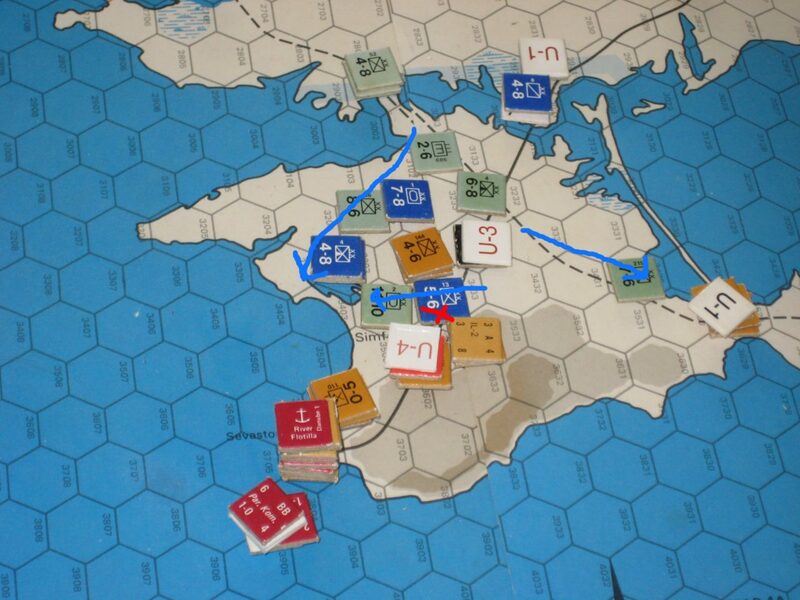 Infantry arriving from other sectors should be in position to assist next turn but no assets are in place for a protracted siege of Sevastopol should the Soviets decide to defend the citadel. Air War; The Luftwaffe provides defensive support to the small portion of the line still unsupplied east of Kursk/Orel but direct their main effort to fragmenting the soviet rail net scoring 8 hits from 15 sorties. A token dive bomber attack on the black sea fleet is aborted by intense and accurate AA fire.